This emergency room medical malpractice claim was filed in Montgomery County when emergency room staff failed to immobilize a man's cervical spine for the first three days of his hospitalization, in spite of the fact that his injury resulted from a fall. It was filed in Health Claims Arbitration on January 26, 2018, and it is the 48th medical malpractice case filed in Maryland this year. A 47-year-old man with a severe mental handicap suffered an unwitnessed fall in his home. His father found him lying at the base of a staircase and called an ambulance. The emergency medical services personnel noted that the man had an abrasion on his right forehead, indicating that he'd hit his head during the fall. Emergency room staff at MedStar Montgomery Medical Center determined that the man suffered trauma to his head and neck region, an altered mental status, and an inability to walk. He was unable to recount the incident and had minimal movement in his extremities. Health care providers ordered a CT scan of the head and cervical spine, but the results could not explain the man's symptoms. The man was not immobilized at any time during his evaluation. He was not placed in a cervical collar and no steps were taken to clear his c-spine. Because the man was unable to sit up or walk, he was admitted to the hospital. Still, he was not immobilized and he did not undergo any repeat imaging to further investigate his inability to walk. Even the physician providing a neurological consult failed to order an MRI to rule out a spinal cord injury. The man's condition deteriorated over the next several days. No health care provider attempted to clear or secure his cervical spine, monitor his neurologic function, or properly control his blood pressure during that time. Finally, after three days in the hospital, an MRI of the man's cervical spine was ordered. The MRI showed a disc herniation at C3-C4, which was causing ventral compression of the spinal cord and spinal canal stenosis. There was also evidence of compression and stenosis at C4-C5. A second neurological consultant responded properly, immediately immobilizing the man's neck and recommending further imaging studies. Unfortunately, the man's spinal cord injury had progressed for too long and the damage was already done. He was transferred to Georgetown Hospital for a surgery on his cervical spine, but the delay in diagnosis and treatment left him permanently paralyzed. 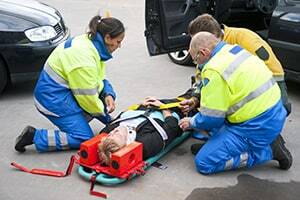 Even the most basically trained first aid responders know that spinal immobilization should be applied to all patients who, based on the mechanism of their injury, have a potential spine injury. The three dangerous mechanisms for spinal injuries are 1) a fall from a height greater than three feet or a roll-and-tumble fall, 2) a sudden, compressing blow pushing the weight of the body against the head, and 3) a high-speed collision, on bicycles or any type of motorized vehicle. Since this claimant fell down the stairs, his cervical spine should have been immobilized from the moment he was picked up in the ambulance. Difficulty with balance or walking is a well-known emergency sign of a spinal cord injury after an accident. Considering the claimant's mechanism of injury, symptoms, and declining health over his three-day hospitalization, it is hard to fathom, assuming the facts in the complaint, that his health care providers did not suspect a spinal cord injury sooner. Failing to recognize that the claimant had suffered a spinal cord injury. Failing to immobilize and/or clear the claimant's cervical spine. Failing to appreciate the significance of the claimant's inability to sit up or walk. Failing to order appropriate and timely tests, including an MRI of the cervical spine. As a result of the defendants' medical negligence, the claimant suffered severe physical and emotional pain and permanent neurologic impairment. Read about more emergency room medical malpractice lawsuits. Take a look at other claims filed against MedStar Montgomery Medical Center.